Grace – Change is possible! Its Friday and I have to say I’m happy it is. Its been a long, cold week here in NEPA. 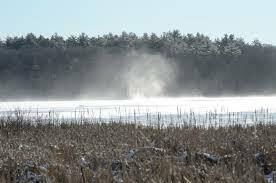 Freezing temps, lots of ice, but more than that, snow devils have been dancing in the fields. I didn’t take this picture, but it explains what I’m talking about for those who may not know the term “snow devils”. The snow devils dancing at my house were much daintier than those pictured here, and they were legion…graceful, and skidding across the snow topped hay fields like so many ballerinas. They twirled and bent in sync with the music of the ages playing in their ears, so that I could almost hear it myself as I watched them move. In their wake, they left drifts two, three, and five feet high. Gorgeous to look at, but treacherous to drive through. Have you ever been stuck in a snow drift? Yeah, that cost me some money. I can’t say this winter has been without its beauty, even though I regularly complain about its chilling effect on us all in NEPA. A week or so ago the neighbors five, count them, five, horses broke loose and came to visit. 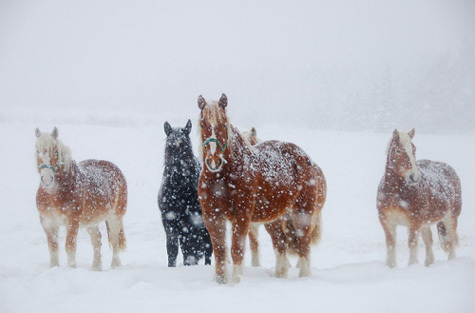 We were getting ready to leave the house when they ran at a full gallop across the frozen, snow-capped fields in front of our house, and around the back hillside. We felt blessed to have a front row seat for this incredible equine action. Horses are scary creatures in my opinion, so I never ride. I rarely get close to them either (despite the fact we own a horse and a donkey), but as they moved across that snowy field, with their hooves kicking up puffs of snow behind them and following one another gleefully, rejoicing in their freedom to do what God intended them to do, we all stood slack-jawed and amazed at their beauty. My son got his cell out and video taped them, but watching the tape is nothing compared to standing there in real-time watching them move. They are powerful animals. I wanted to share these reflections from life on a snowy Friday as a reminder to myself and anyone reading along with me today that God is good, that He made a beautiful world for us to enjoy, that He meant for us to stop and stare, and that His purpose has always been for us to seek Him, find Strength, be Beautiful in our own way, and dazzle the world with the grace He provides. When has the beauty of the world captivated you? How have you used inner strength to meet a goal in your life? Cupboards cleared of junk? Yep. Fridge full of veggies? You bet! The post holiday eating begins. I didn’t wander too far afield of healthy eating during Christmas, but I did enjoy some of my favorite treats. I sampled some of the rugelach I make every Christmas for friends and family, and I enjoyed a slice or two of the plum pudding that friends make for me each year. Yum, Yum…they were so good and totally met my expectations for Christmas splurging. I also stuck with tradition and made sausage and spinach quiche for Christmas morning breakfast/brunch. That stuff is loaded with calories, but I only make it on Christmas, so on Christmas I enjoy it without guilt. I tried a new recipe during the holiday. A parmesan vegetable tian that I had seen showcased on a few blogs I visit frequently. It was good and most of all, pretty, which helped to make our meal festive. As always, I tried to use as many fresh and frozen veggies as possible in our meal prep. My kiddos love veggies, so it’s not hard to do. We had company with us for most of the holiday and lots of people in and out, which was fun, but exhausting. I’m still recovering from all the play. I ache for at least two weeks after I do one of these family marathon things, but its worth it. Eventually, all the joints and muscles will calm down, and then I will be glad for all the family fun time we had during Christmas 2014. 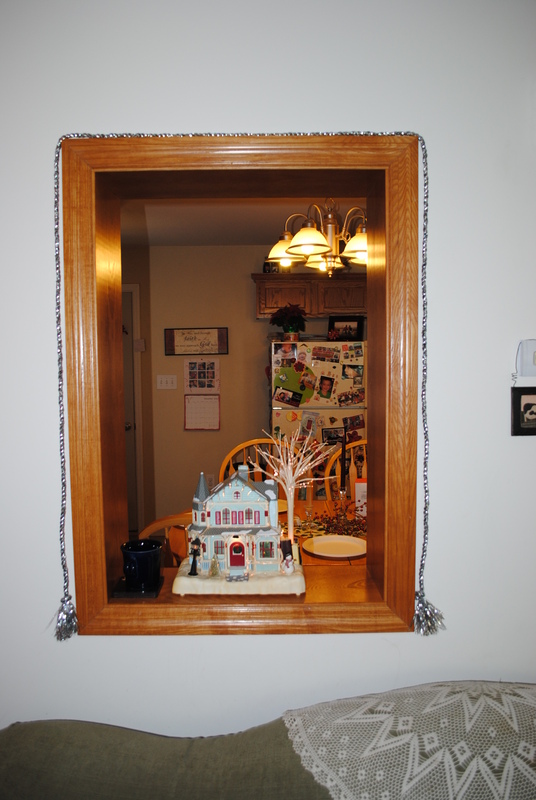 I thought it would be fun to share a few snapshots from around the house during the holiday. I don’t think I have any of the food, but a few decorations were captured on my digital camera. 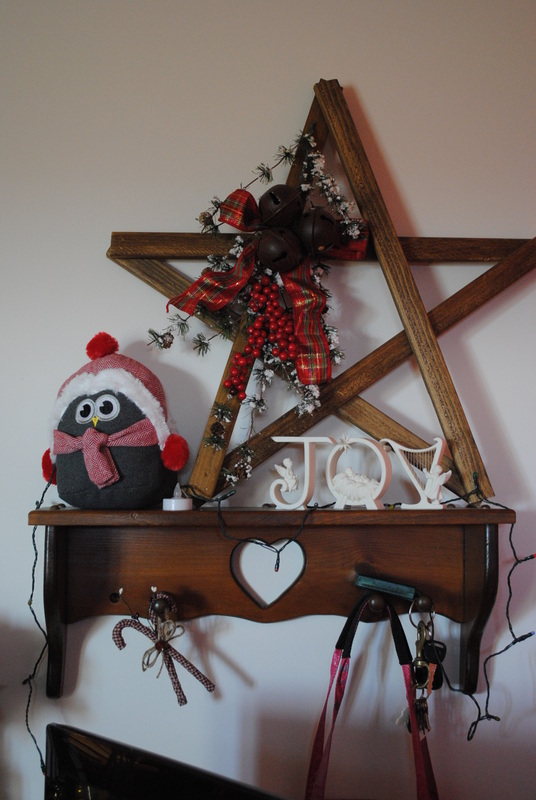 Everybody raved about the lil owl I displayed this year, which was amusing to me because he was a dog toy that I paid a few bucks for, but he is adorable and owls are big this year. Our DVD holder was covered with a mish mash of holiday stuff. 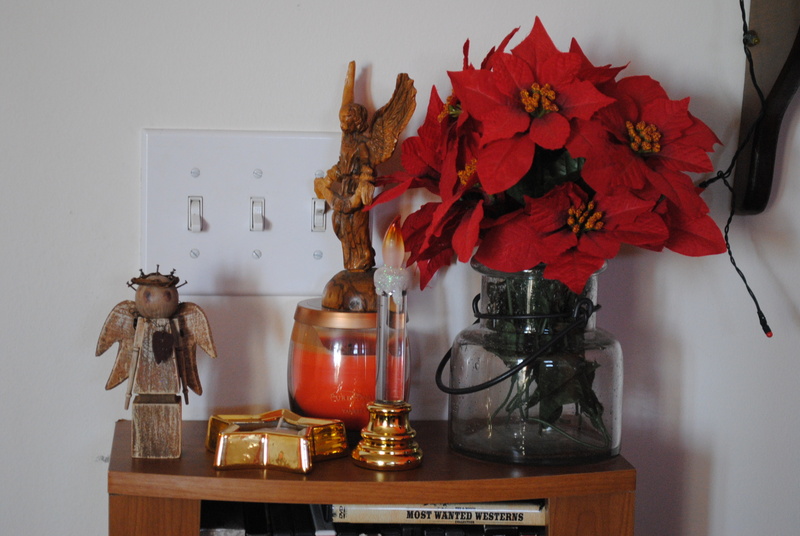 The carved olive wood angel on top of the candle was a gift from my son upon his return from Israel during his college days. This gift was from my niece. She’s so crafty, and the background color on this piece perfectly matched my wall, which is not easy to do. 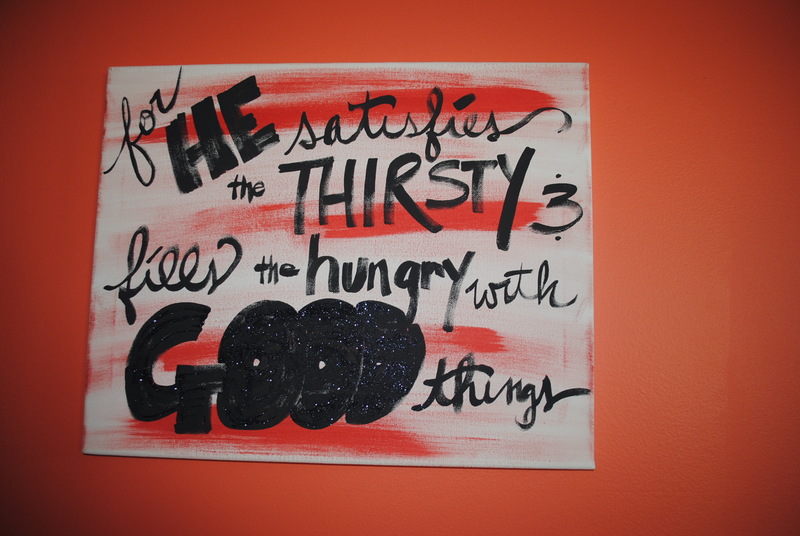 You can’t really tell it in this picture, but the word GOOD on the painting is covered in glitter so it sparkles. I love homemade gifts! Oh, I did find a picture of some of the good eats we had at Christmas. 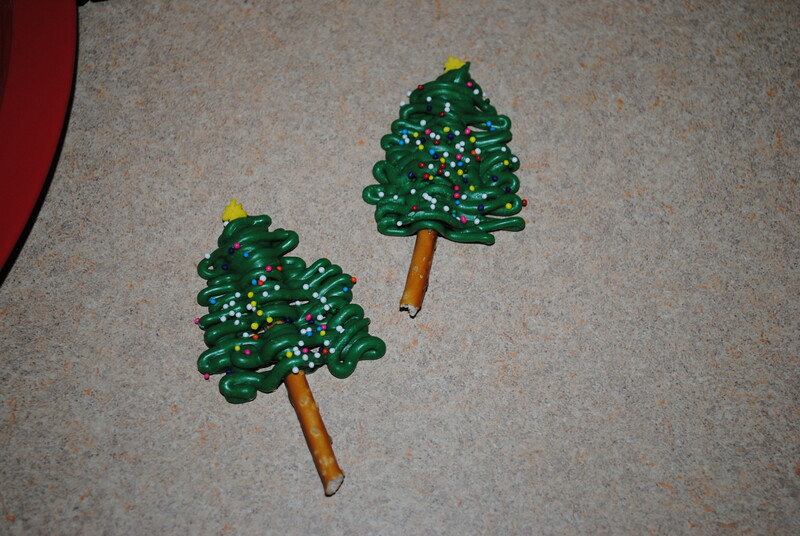 These are chocolate Christmas trees I made following a recipe on Pinterest. I thought the kids would enjoy them, and they did. We put them in the top of cupcakes on the day our house was full, full of kids. Six wee ones and seven adults filled the house that day–what a crew! Most of the kiddos were under 6 yrs old, making for a lot of noise and a lot of eating. I think everyone went away satisfied. My lighted Christmas house. We get this out every year. It’s prettier when the lights are out; so soothing. Finally, a new favorite was added to the mix this year. These pieces are the remnants of an antique chair that have been re-purposed. 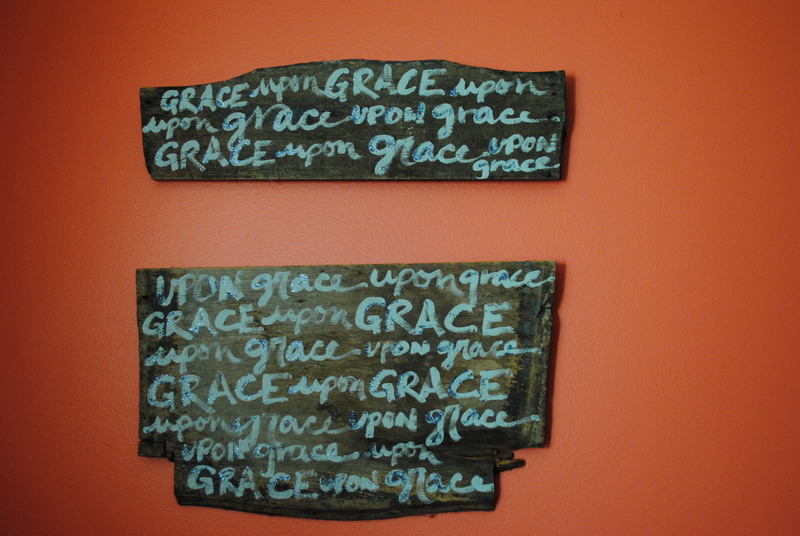 The words painted on the wood say: GRACE upon GRACE upon GRACE upon GRACE. I love it! I think Grace is going to be my mantra for the new year. After all, who couldn’t benefit from either receiving or giving a little more grace? I’ll be back with another post about the food and how things turned out during the holidays with the scale. Christmas Eve is upon us and with it comes sweet release. Tonight is the night I exhale. No more shopping…no more waiting…no more planning, and no more baking. 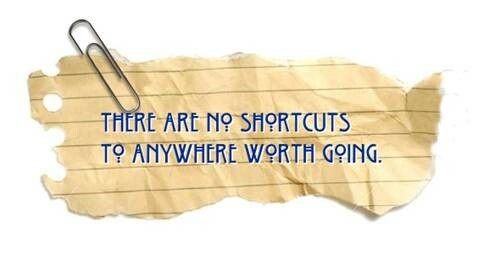 Everything that needs to be done has been done, and whatever didn’t get done, won’t be done. It is as it should be. Tonight, I relax, and I allow His Spirit to transform me from a shopping machine to a willing repository of His grace. Grace: that magical, mystical mix of love and caring, forgiveness and restoration, humility and exaltation that builds, and saves, and strengthens. How I love it! Unconditional love. I don’t deserve it, nor can I earn it, and yet it is given to me over and over, and over again. Where would I be without Grace? Forgiveness, without which we are all destined for slavery, imprisoned in cells of self with no hope of escape. Forgiven, I am wrapped in warmth, encouraged to let go…prompted to try again, this time with the understanding that I don’t need to be perfect so long as I’m forgiven. Forgive, as I am forgiven, that is my goal for 2015. Hope. Hope renews my soul and keeps me from being hardened by a harsh world. It convinces me that there is a path to the place I want to go, and I can walk it in the here and now. Hope helps me formulate a plan, stick to it, and benefit from it. Without hope, I would never weigh myself again. Never journal a single meal. Never look for results from my efforts. Hope keeps me ready to receive the good things in life and keeps me stepping on that scale. Love. Who can forget love? Love is the glue that holds everything else in life together. Love helps me become open and willing to accept the advice of others. Love guides me. Love affirms me. Love enfolds me. I am loved and in return, I love. Tonight, I meet with Love and pay homage. Love is the essence of Christmas, and I, its humble servant. Tonight, I exhale. Ahhhh, that feels good!